John Kerry was in Moldova today, among other reasons to promote its wine. As the first U.S. secretary of state to visit Moldova since James Baker went there in 1992, Kerry toured a winery and sampled its wares, unveiling a new label that will adorn Moldovan wines sold abroad. He announced a trade mission that will send Moldova wine-makers to the U.S. to learn about the American wine market. Wine is a significant export for Europe’s smallest economy: As of 2005, Moldova ranked 7th in world wine exporters, according to the Moldova Wine Guild, which notes that Moldova is “highly dependent on wine,” which forms the “backbone of the agricultural sector.” In 2009, Moldova exported $161.4 million in wine according to a report by Moldova’s economic ministry. 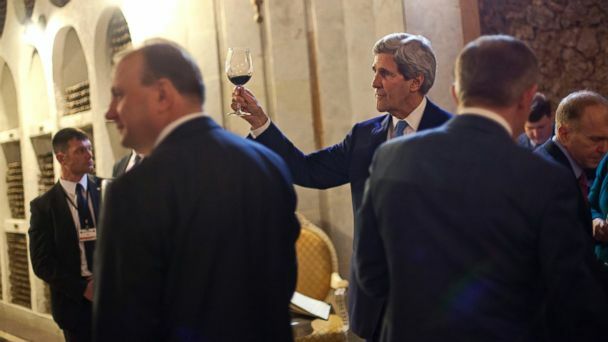 Why does Kerry care so much about Moldovan wine? The answer has to do with Europe, Russia and protests raging right now in Ukraine. Moldova, along with Georgia, recently finalized a trade partnership with the European Union. Roughly 290 miles north of Moldova’s capital, Chisinau, where Kerry visited with Moldova’s president and where he sipped wine on Tuesday, protesters have seized parts of Kiev to protest Ukranian President Viktor Yanukovych’s refusal to sign a similar agreement with the EU. Kerry, notably, chose to visit Moldova instead of Ukraine, congratulating Moldova on its EU partnership in an appearance with President Nicolae Timofti.